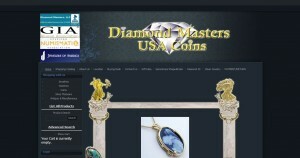 Diamond Masters – USA Coins address, phone, website, hours of operation, and more. Diamond Masters – USA Coins specializes in selling unique estate pieces of all time periods, old currency and coins, certified diamonds. Diamond Masters – USA Coins is also a prominent buyer of precious metal jewelry items, paying top dollar to anyone looking to sell unwanted, unworn or broken items.